It’s been a long time between drinks, I have to say. Or more correctly, it’s been a long time since a motorhome designed for the retail market rolled out of the Action factory at Albany in Auckland. – the Everland R725 and R705, with more to come. After a few email exchanges with Action’s general manager Malcolm Horne and product manager Moira Brady, the keys of prototype R725 were soon in my hands and I was driving out of the factory gates. It’s the driving bit where the first item of interest occurs. Instead of the ubiquitous Fiat Ducato, Action have opted to use a Renault Master Platform cab chassis which has a GVM of 3500kg. The R725 has a tare of 3105kg, so there is plenty of load capacity. Powering the Renault is a 2.3-litre, 110kW/360Nm turbo diesel with a six-speed AMT gearbox, not unlike that used in Fiat’s Ducato. Certainly the motorhome gets along well enough on the road. On the few hills I found on my little test drive the AMT gearbox was reasonably responsive when moving up and down through the gears. 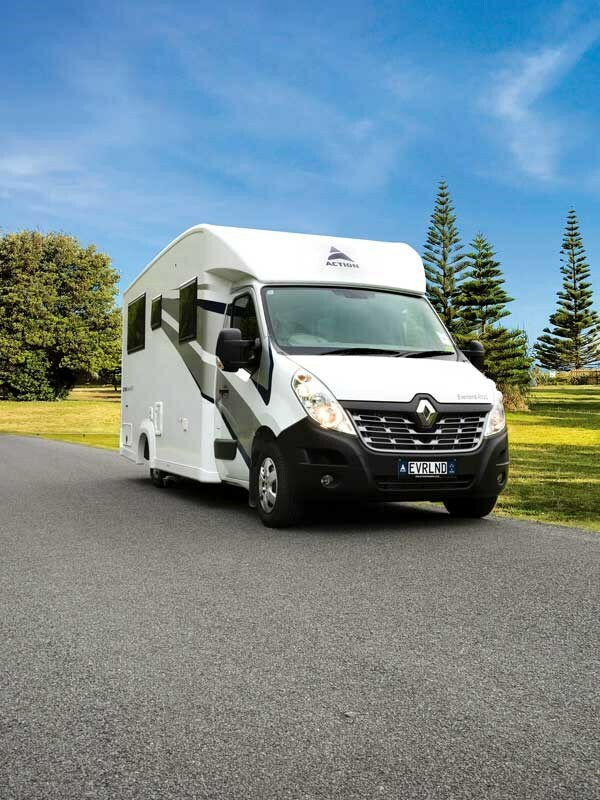 One result of using the Renault cab chassis is that the motorhome does sit rather low to the ground, consequently a bit of care will be needed when negotiating steep driveways. 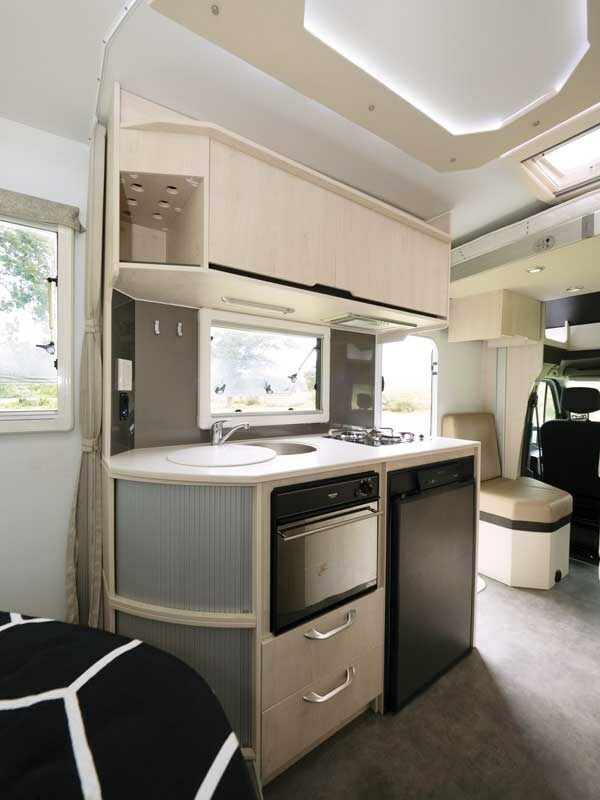 For the motorhome’s basic construction, OmniPanel – a composite structure with Styrofoam sandwiched between fibreglass sheets – is used all round, including the floor. In the latter case, it is fully sealed to prevent water and dust getting in. 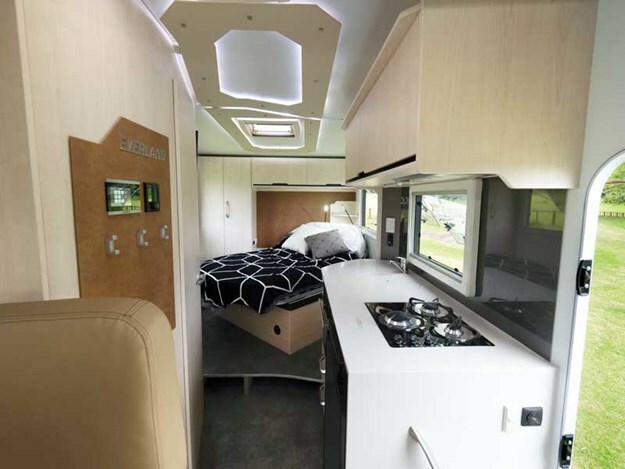 Some motorhomes look like a bit of a square box, but the Everland scrubs up quite well, with the fibreglass mouldings back and front giving it a nice streamlined look. The habitation door is a Camec triple lock security screen setup and the windows are the standard double-glazed acrylic type. A good feature of the Everland is the rear tunnel storage. It’s not quite as large as some of the European ‘garages’ but more than adequate for the usual camping equipment. There are the expected bin doors for items like the cassette toilet and the gas cylinder bin – one 9kg cylinder. I often think two 4kg cylinders might be more practical. 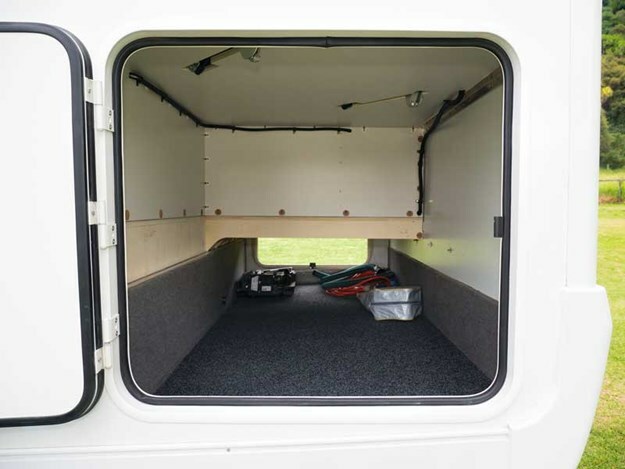 A Euro Carry bike rack, fitted to the rear wall, is included as a standard specification, and an awning will be installed in all production models. 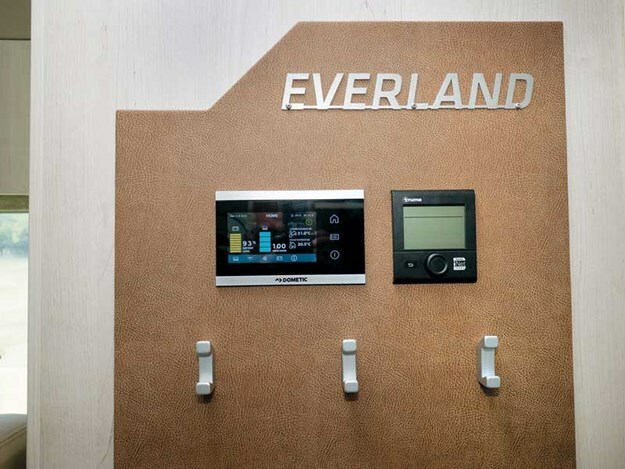 Inside the Everland, the cabinetry is all made with 15mm sustainable plywood fitted together using cam and dowel construction. ABS plastic sealed edge-taping is used to minimise water penetration. 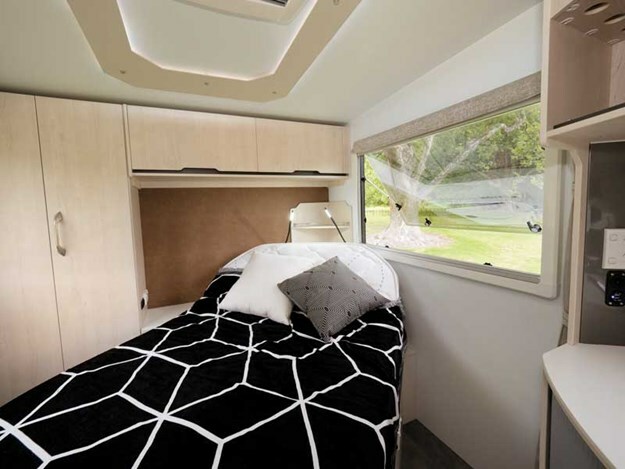 What’s most interesting about the R725 design is that although the front dining/lounging and mid kitchen/bathroom areas look fairly conventional, the rear bedroom is not! Action have turned the 1900mm x 1300mm island bed 45 degrees to the offside. To fit the bed in properly, the wardrobes have been offset to the left and the overhead lockers to the right. Fitting in bedside cabinets was always going to be tricky, but the person towards the back gets a bedside shelf and the other occupant makes do with a shelf area behind the bed. Another bonus with this design is that the pillow area of the mattress can be raised quite easily, so anyone desiring to rest their weary bones during the day without actually lying right back can do so quite easily. At first glance the overall bedroom design might look a bit odd, but it all seems to mesh together quite well. Even the walkaround space isn’t too bad. There really isn’t any storage area under the bed; lifting the bed base gives access to the Truma Combi 2E water and space heater. This area looks a little more conventional, although even here, a few features are different. The three-burner hob doesn’t have a lid; indeed it sits proud of the benchtop, but the round stainless steel sink does. At first there doesn’t appear to be a microwave, but it’s hiding behind one of the overhead locker doors. A nice little touch is the wine bottle holder at the rear end of the overhead lockers and the wine glass holders in the roller shutter storage under the kitchen bench below. Also fitted under the benchtop are a Thetford grill/oven, Thetford 128-litre fridge and two drawers. 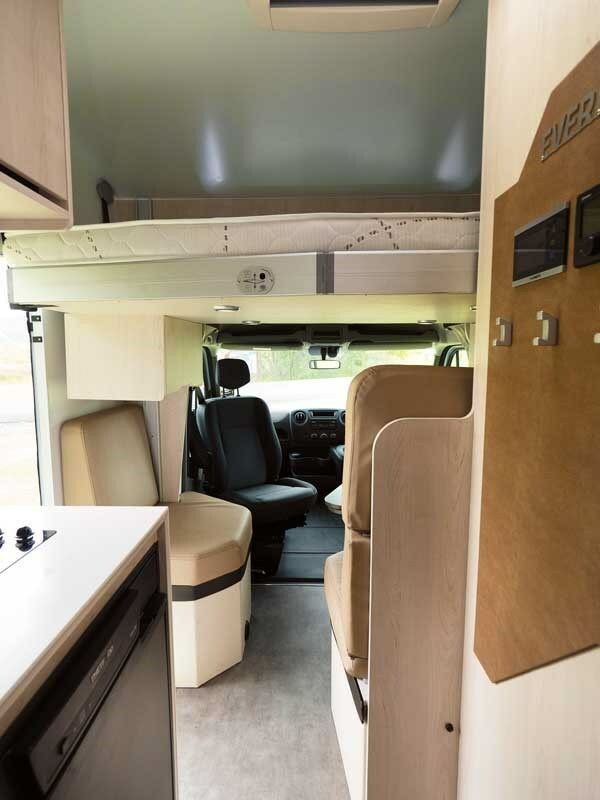 Being a prototype motorhome, a few things will be different in future models, like the edge of the benchtop, which will have a lip around the edge – much better for minimising water spillage on the floor. 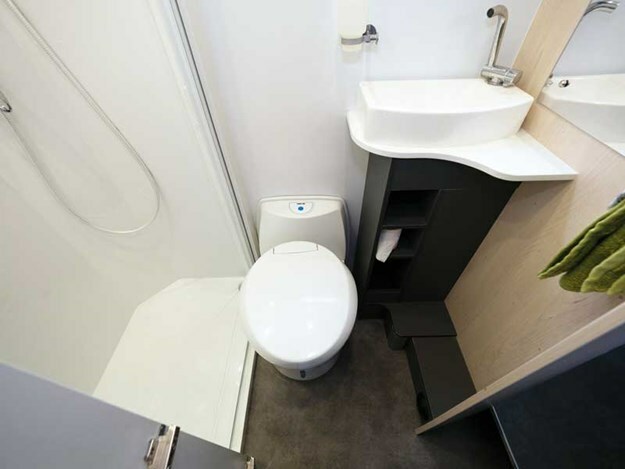 Bathrooms in many a motorhome are often quite compact. There’s always a bit of compromise in the space department. This bathroom does have the expected items, like the shower cubicle, Thetford cassette toilet, and wash basin on a neat little pedestal. A look at the interior would suggest there isn’t enough room around the toilet with the bathroom door closed, but Action have been clever and put a right-angled piece of ply down the door edge so the door can be opened to the width of the timber and still be ‘closed’. A smart but simple idea and I understand future models will have a slightly wide ‘edge’ to get the door out even further. 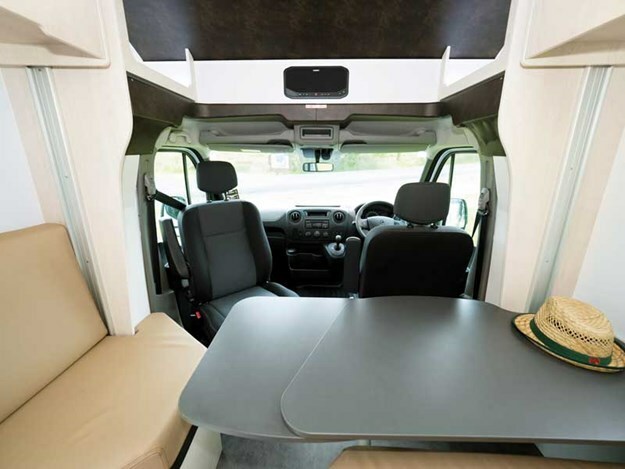 Another prototype feature in this motorhome is that only the passenger seat swivels around, but in future models both cab seats will turn around, meeting neatly with the table behind. There are two other seats behind the cab, a forward-facing two-person seat complete with seat belts, and between the passenger seat and the habitation door, a lounge seat that faces sideways. All are designed to fit around the table. In the R725, the switching and control system is quite simple. Mounted on the outside of the bathroom wall is a Truma panel for the hot water/space heater and a Dometic touch panel for just about everything else – batteries, water tanks, lighting and solar panels. On the 12V power side of things, the Everland is quite well kitted out with two 100AH deep cycle batteries and a 140W solar panel. It’s great to see a new motorhome roll out of the Action factory. Even better, while not a radical design, the Everland R725 does have a few new features. Some are quite obvious, like the angled bed, and others less so, like the toilet door modification. It all adds up to quite a classy looking motorhome. 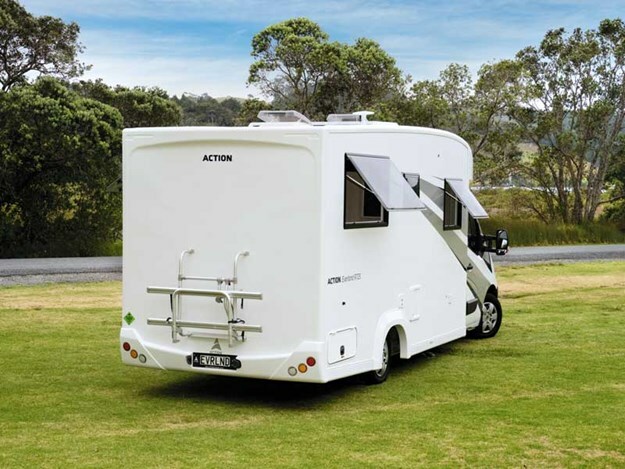 For more information, visit actionmotorhomes.co.nz.